The Digistar Users Group began in the mid 1980's as an informal gathering of planetarians. This first gathering took place in St. Louis, Missouri (USA). At the time there were only five Digistar systems world-wide. Today there are more than 300 Digistar equipped planetaria on six continents. The current Digistar product line includes Digistar II through Digistar 5 systems in various configurations appropriate for domes of nearly any size. While Evans & Sutherland is the manufacturer of Digistar systems, it does not operate the Digistar Users Group. 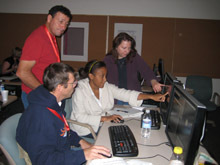 Membership in the Digistar Users Group is voluntary - the organization is member driven, and member governed. Membership runs on an annual basis, and most members choose to pay their DUG dues at the time of the annual DUG meeting. E&S is the "Manufacturer Member" as indicated in the DUG charter, and participates fully in the organization. Membership in DUG is required in order to access the DUG show/model library, past newsletters, meeting notes, standards documents, our charter and standing rules, and other content. Membership is currently $20(US) per year, payable to the DUG Treasurer. Evans & Sutherland pays the first year dues of all new Digistar installations. After that time, it is the site's responsibility to maintain in contact with the organization and keep their membership active. One of the primary activities of the Digistar Users Group is its annual meeting. This is a unique opportunity to exchange production techniques, planetarium operations concerns, Evans & Sutherland service and support, system maintenance, and ideas for new Digistar features. Other activities include participation in IPS technology and standards efforts, ongoing member communication and peer assistance, and content sharing. During the annual meeting DUG also acknowledges content sharing efforts via a collection of awards. These awards are given for useful, interesting, and entertaining content shared with all DUG members. DUG also honors an individual member for outstanding service. This award is called the Jim Hashimoto Award. Today there are Digistar systems in a wide variety of venues. Planetariums, Colleges, Universities, Schools, Science Centers, Museums, Entertainment destinations and other locations have all chosen Digistar for its unique features.